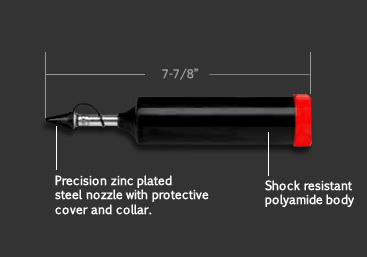 Push Type Grease Gun with Pointed Nozzle for Flush Type Fittings. Grease sold separately. 4.8 oz. Bulk Capacity / 1,740 psi Max Operating Pressure. Overall Length = 7-7/8". Tube = 1.66" x 5.5"
SAE Products® push type grease guns are compact and portable, ideal for quickly greasing lawn mowers, chain saws, ATV's, autos, pallet trucks, boats, jet skis, etc. Small enough to fit in a tool box.